ARP provide approved solutions to seal, encapsulate or enclose the asbestos containing ma-terials, as required by the Code of Practice for the Management and Control of Asbestos in the Workplace [NOHSC:2018(2005)]. 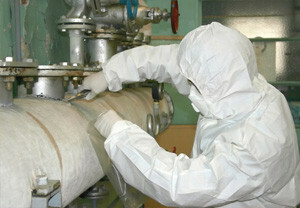 ARP is a specialist in asbestos encapsulation and asbestos removal. It is well documented that incorrectly removing asbestos sheets can cause severe health risks. What many people do not know however, is that leaving asbestos roofs to weather is equally as dangerous, with the asbestos material breaking down and releasing fibres into the atmosphere. One of our tests detected 36% of loose asbestos fibres in the material accumulated in the gutter of an asbestos roof. There are few products available on the market that are approved to bind, seal and encapsulate asbestos fibres on exposed surfaces of asbestos containing materials. ARP use only approved materials for encapsulation of asbestos. Contact Asbestos Removal Projects for a specific, cost effective asbestos treatment solution to encapsulate or seal asbestos on your property.